Join this session to uncover the latest trends in corporate to bank integration, its challenges, and the benefits of a hybrid approach. Learn how a top multinational bank leveraged a managed services approach to hybrid integration and rapid onboarding, turning a barrier into a competitive advantage. Meeting the ever-changing requirements of regulations is an increasing and costly challenge for all organizations in the Financial Services sector. All the while, customers demand faster transaction times and highly available information from financial institutions. Today, fax remains at the core of many Financial Services information exchange processes. Paperless digital fax solutions mitigate the compliance and security risks involved in document exchange, while driving customer service. This webinar discusses how digital fax helps automate and integrate faxed content – and its data – with the applications that power business processes. Learn how a hybrid fax deployment, combining integrated on-premises fax software with the cloud for fast and scalable transmissions, decreases compliance risk, reduces transaction times and improves customer satisfaction – all in a single solution. As companies seek to improve cash flow, achieve greater cash visibility, consolidate their bank relationships, increase straight through processing, and reduce bank fees and costs, treasurers are undertaking strategic digital transformations of their financial, IT and business operations. Part of that transformation should include an examination of whether their network connectivity is hampering the process. 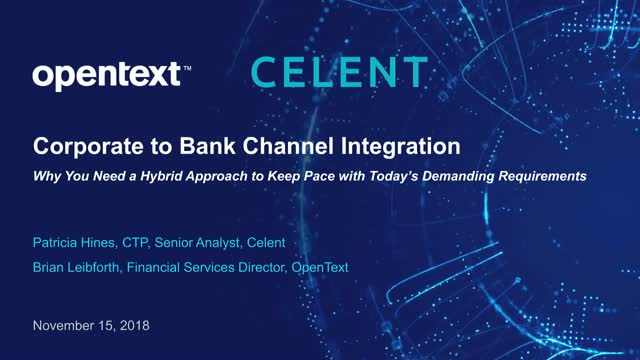 In this webcast, OpenText will review its own treasury transformation journey and describe how, by leveraging the capabilities of its Business Network division, it was able to speed up its connectivity to banks and achieve higher STP rates and better cash visibility across its global banking system. We will review the challenges of corporate to bank integration and the solutions that OpenText can provide. You need full visibility into your supply chain to take the optimal course of action for your business. And, you can derive actionable intelligence from your supply chain by applying embedded analytics to your B2B transactions. This enables more informed business decision-making and improved performance. How well information flows into and out of your supply chain network can have a significant impact on your business performance. If communication and transactions are hindered, the results can be disastrous – late payments, missed deliveries, unhappy suppliers, and disgruntled customers. Automating interactions with your trading partners can streamline your supply chain operations while increasing visibility. It means that transactions between you, your suppliers, and your buyers happen electronically and automatically. Whether you're looking to simplify supplier integration and collaboration with procure-to-pay, optimize your inventory levels with logistics track-and-trace, or leverage e-invoicing to reduce errors and contain costs, automation is essential to boosting supply-chain efficiency. And a more efficient supply chain can lead to reduced costs, greater agility, and revenue growth. In this webinar, IDG Director of Content Marketing Strategy Rob O'Regan and OpenText™ Director of Product Marketing Greg Horton discuss the advantages of automating supply chain networks. Find out how automation can help you derive more value from your supply chain.